Awww Jeah!! 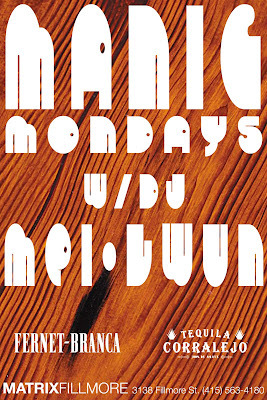 The amazingly awesome weekly party called MANIC MONDAYS is starting your December with a bang. Resident Dj Mei-Lwun hosts the very entertaining Dj Solomon with a special VIDEO set on MANICS big screen and if that wasnt enough to get ya shaking we've got a special international guest Riga's top Dj Ai-Va opening things up. Get there early so you dont miss any of the action. As always drink special on fernet and corralejos to keep my bar peeps happy and bottle service/ reserved tables avail from a very affordable $40 for a bottle of vino. Call the club for details 415.563.4180 or email djmlsf@gmail.com and i'll hook it up!! Celebrate your NYE hangover Jan 1st @ FLOSSY! Last Blast '09 MANIC MONDAYS Tonight! Don Lynch n me get MANIC this Monday SF! !